Moore International has considerable machining capabilities, which can be applied to all of the types of screws we supply regardless of diameter and type. We can work directly from your drawings, your CAD files or, if you don’t have them, why not send us a sample to copy? Although all types of end machine detail can be produced, we offer a very cost-effective basic end journal machining that fits our range of support bearings. By asking us to do your machining you can reduce your scrap rates, reduce your component lead times and receive products that fit your application every time. A custom nut doesn’t have to come at a custom price! We can offer you a complete custom nut facility for any of our lead screws. With low quantities available, you have the freedom to design your nut around the product and not your product around a nut. 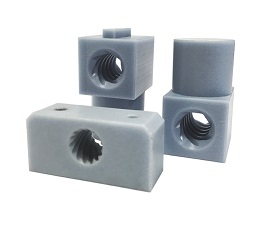 Our team of skilled machinists can work with you to design, recommend and manufacture a nut to fit your requirements. This could be for one of our Swiss-made Eichenberger Gewinde Speedy or Rondo lead screws or for a standard trapezoidal screw thread. 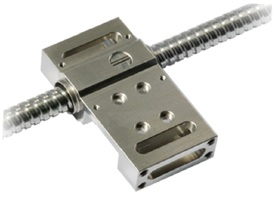 We normally stock up to 3-metre lengths of ball screws and lead screws in both left and right- hand formats. We’re able to supply screws from 4mm diameter in steel, stainless steel or light-weight aluminium. As for the nuts, if you don’t need a custom nut we have a large selection of standard nuts available from stock for immediate dispatch. We have several CNC machining centres with high-specification 4th axis CNC mills and CNC driven tool lathes with a high volume bar feeder. We also offer sub-assembly production for your new components. Our dedicated assembly team will assemble a collection of parts to your specification, at the highest level of quality and deliver them to you with your part number attached for easy traceability. With our large range of machines available, why not give us a call with your machining requirements?